Ever since Lemaitre and Hubble’s first proposed it in the 1920s, scientists and astronomers have been aware that the Universe is expanding. 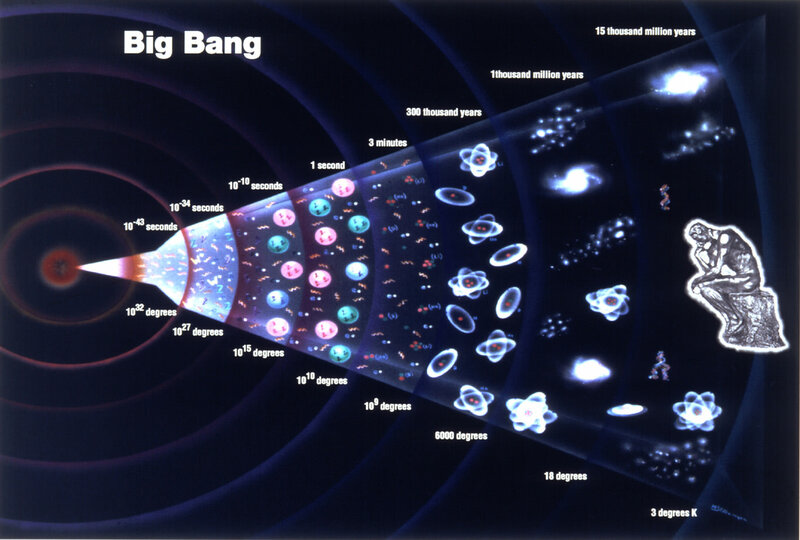 And from these observations, cosmological theories like the Big Bang Theory and the “Arrow of Time” emerged. Whereas the former addresses the origins and evolution of our Universe, the latter argues that the flow of time in one-direction and is linked to the expansion of space. For many years, scientists have been trying to ascertain why this is. Why does time flow forwards, but not backwards? According to new study produced by a research team from the Yerevan Institute of Physics and Yerevan State University in Armenia, the influence of dark energy may be the reason for the forward-flow of time, which may make one-directional time a permanent feature of our universe. Today, theories like the Arrow of Time and the expansion of the universe are considered fundamental facts about the Universe. Between measuring time with atomic clocks, observing the red shift of galaxies, and created detailed 3D maps that show the evolution of our Universe over the course of billions of years, one can see how time and the expansion of space are joined at the hip. The question of why this is the case though is one that has continued to frustrate physicists. Certain fundamental forces, like gravity, are not governed by time. In fact, one could argue without difficulty that Newton’s Laws of Motion and quantum mechanics work the same forwards or backwards. But when it comes to things on the grand scale like the behavior of planets, stars, and entire galaxies, everything seems to come down to the Second Law of Thermodynamics. This law, which states that the total chaos (aka. entropy) of an isolated system always increases over time, the direction in which time moves is crucial and non-negotiable, has come to be accepted as the basis for the Arrow of Time. In the past, some have ventured that if the Universe began to contract, time itself would begin to flow backwards. However, since the 1990s and the observation that the Universe has been expanding at an accelerating rate, scientists have come to doubt that this. If, in fact, the Universe is being driven to greater rates of expansion – the predominant explanation is that “Dark Energy” is what is driving it – then the flow of time will never cease being one way. Taking this logic a step further, two Armenian researchers – Armen E. Allahverdyan of the Center for Cosmology and Astrophysics at the Yerevan Institute of Physics and Vahagn G. Gurzadyan of Yerevan State University – argue that dark energy is the reason why time always moves forward. In their paper, titled “Time Arrow is Influenced by the Dark Energy“, they argue that dark energy accelerating the expansion of the universe supports the asymmetrical nature of time. Often referred to as the “cosmological constant” – referring to Einstein’s original theory about a force which held back gravity to achieve a static universe – dark energy is now seen as a “positive” constant, pushing the Universe forward, rather than holding it back. To test their theory, Allahverdyan and Gurzadyan used a large scale scenario involving gravity and mass – a planet with increasing mass orbiting a star. What they found was that if dark energy had a value of 0 (which is what physicists thought before the 1990s), or if gravity were responsible for pulling space together, the planet would simply orbit the star without any indication as to whether it was moving forwards or backwards in time. But assuming that the value of dark energy is a positive (as all the evidence we’ve seen suggests) then the planet would eventually be thrown clear of the star. Running this scenario forward, the planet is expelled because of its increasing mass; whereas when it is run backwards, the planet closes in on the star and is captured by it’s gravity. In other words, the presence of dark energy in this scenario was the difference between having an “arrow of time” and not having one. Without dark energy, there is no time, and hence no way to tell the difference between past, present and future, or whether things are running in a forward direction or backwards. I’m sorry, I am very much an amateur and maybe this question is too difficult to answer here in laymans terms, BUT. I cannot see that time is only the result of the expanding universe and that Dark Energy is the driving force and ergo if the Dark Energy were to reduce or reverse then time would go backwards as well. Am I barking up the wrong tree? I would appreciate an answer, I am not a scientist or professional just an interested bystander in all these things. Do you have a mechanism in mind by which Dark Energy (ie. the expansion of space) might reverse? Thank you for replying. This is my first post so to see the discussion was interesting and helpful. I have always regarded the notion postulated that there is “Dark Matter” and “Dark Energy” as hard to believe. As I say I am a complete novice, just interested. Thanks Matt for an interesting article. As to the mechanism for reversal of “Dark Energy”, I suppose I was equating the Big Bang to a simple explosion where I have observed matter flying out in all directions and the energy expanding then seemingly contracting back to the source. Is this a correct observation? I’m not sure. Topics like this are very frustrating to me. Dark energy has yet to be remotely proven. If anything, it’s even less certain than dark matter. Both however, lack significant observational evidence, and are created more as constructs to answer aspects of the universe which scientists don’t understand. And yet here, we already have countless teams of researchers basing new theories off of ones that have yet to be proven. This doesn’t feel like the scientific method to me. Dark Matter has quite a bit of second hand observational evidence such as from Gravitational Lensing as well as the seen orbits of large stars around the Galactic Nucleus. Not entirely. Astronomers can detect gravitational lenses, and galaxies spinning faster than conventional theory says they should. But that doesn’t necessarily mean there HAS to be a huge amount of mass there. It could just as easily mean our gravitational theories are not entirely correct. [cont] … it was flat. To balance the cosmic weighing scale, that has to mean there’s a lot of mass we hadn’t accounted for in the Universe. But that’s not the only evidence. The Universe is expanding, and the rate of expansion has, in relatively recent times, being getting faster. In fact we can measure the rate of expansion over time by observing the red-shift of galaxies of different distances. Those observations tell us that that there’s a mass associated with empty space itself, which is constant for a particular volume. At earlier times in the Universe when it was much smaller, the energy density was dominated by gravity. But as the Universe has grown up to the present day, it has come to be dominated by this mass which is directly relational to the expansion. So although we have very little idea what Dark Energy is (there is a candidate, although it’s problematic), the Universe has told us very specifically that it’s there. Dark matter has been observed repeatedly in the form of dark matter “halos”. And the influence of dark energy has been tested through the measurement of the cosmic microwave background, gravitational lensing, and the large-scale structure of the universe. This is beyond theoretical testing, and hence far beyond being “remotely proven”. I think your articles are great, Matt, but I’m going to have to disagree with you there. My understanding is that “dark energy” came about because astronomers were at a loss to explain the continued expansion of the universe at its current rate. Hence, they *assumed* there was a large amount of “hidden energy” present. Again, doesn’t mean it’s real or not real, but I think there’s an equal chance that our current theories are simply incomplete, or in need of revision. Quite possibly, and the evidence is indirect as it is. It would be fairest to say it is a theory that currently fits the observational evidence, limited though it is. If only all of astronomy and astrophysics acidamia asked you for wisdom then they would understand. Wow – after 5 minutes figuring out how to log in I’m struggling to remember what it was… oh yeah. “one can see how time and the expansion of space are joined at the hip.” So maybe we should start talking about… oh, I don’t know, let’s call it – spacetime. Lemaitre and Hubble, nice work…but what about the greatest of them all – Knut Lundmark! He was some years earlier and had better results according to the expanding universe and even the idea of dark matter. Previous PostPrevious How Do Volcanoes Erupt? Next PostNext Can Stars Be Cold?